Our adults class follows a curriculum of grades to which each student trains towards. 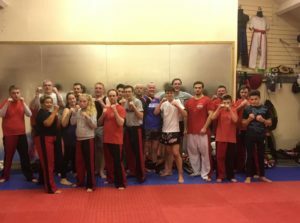 An excellent all round hour long class improving fitness levels and martial arts skills. Excellent kickboxing and self defence skills are learnt weekly and built upon. During the technical part of the session students take advantage learning a wide range of martial arts styles and skills. The class includes high level kickboxercise workouts to fat burn and improve stamina. It also includes stretching to tone the body and improve agility. Students with yellow belt and above have the option to learn and take part in sparring sessions. Students will also have the option to take part in kickboxing association and interclub competitions, or to spectate and support others.